Thunder Bay’s finest spoken word performers, singers and songwriters presenting 30 Urban Interventions to the public September 27 and October 1st to 6th. An initiative of Definitely Superior Art Gallery in order to present a series of 30 spoken word / singer-songwriter performances throughout the City of Thunder Bay to promote literacy, art & poetry in places where people live their everyday lives. 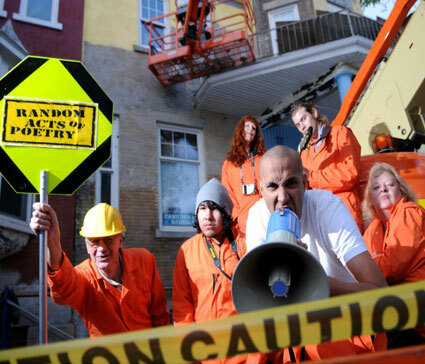 See and hear the Definitely Superior Poetry Construction Crew as they randomly bring urban interventions to our public venues, schools and institutions, coffee shops, radio, television, street corners, transit…your very home! Spoken Word Poetry Construction Crew 2012: Shy-Anne Hovorka, Holly Haggarty, Chris Waite, Keith Secola (Arizona), Morningstar, Nolan Schmerk aka Solomon, Jacob Vaillant, Kianwe & T.Ko of The Fam, Douglas Livingston, Mary Frost, Sue Blott, Taina Maki Chahal, Rian Shortwave, Juliann Robbins, Steven Gothard, Sharon Irvine, Erin Stewart, Jamie Smith, Scott Pound, Jess Horricks, Chris Roy, Heather Esdon, Sherri Lankinen, Sara Mackie, Aubrey Brandt, Renee Terpstra. Schedules available at gallery & on www.facebook.com for one of the largest poetry performances in Canada. Please plan to arrive at a location at the beginning of a listed estimated time-frame … to ensure that you don’t miss us! Poet Crew: spoken word: Steven Gothard, Douglas Livingston, Tricia Roy & Mary Frost; singer-songwriter: Rusty Brown. Poet Crew: hip-hop spoken word: Solomon. (Nolan Schmerk) & Kianwe with T.Ko of The Fam; spoken word: Steven Gothard; singer-songwriter: Rian Shortwave (+ others TBA). Poet Crew: spoken word: Heather Esdon, Erin Stewart, Holly Haggarty (+ others TBA). Poet Crew: spoken word: Taina Maki Chahal, Erin Stewart, Holly Haggarty, Betty Carpick, Sharon Irvine; singer-songwriter: Rian Shortwave.